Most of you are aware that India in the midst of mobile revolution. Mobile subscribers in India are growing at nearly 100% year on year and rural subscriber growth is taking lion’s share of it. Recently TRAI announced that India has reached 250 million subscriber targets much before scheduled time. This pace of growth is expected to remain for atleast a few years from now. Traditional advertising is now giving way to mobile advertising, which is more personal and better targeted. The conversion rate for mobile advertisement is expected to be much higher than print or TV advertising. This opens up a huge avenue for advertisers to market their product or get their message across. Take the recent example of Fair & Lovely scholarships ad campaign, promoted via Reliance Mobile, which got selected as a finalist for the US-based 2007 Mobile Marketing Association Awards. (via agencyFaqs). Reliance Mobile — which has an active subscriber base of over 35 million and 20 million Reliance World application enabled hand-sets — executed a pan India ad campaign from mid August to mid September, 2007, on Reliance Mobile phone network. Clickable banner ads in various languages and a special Fair & Lovely Scholarship Zone was created for R World. The banner ads were linked to a microsite where interested students were supposed to provide their details like annual family income and the course they intend to pursue. SMS marketing using Short Code (51234) and Instant Voice Response (IVR) system in some cities were also used to inform students about the scholarships. 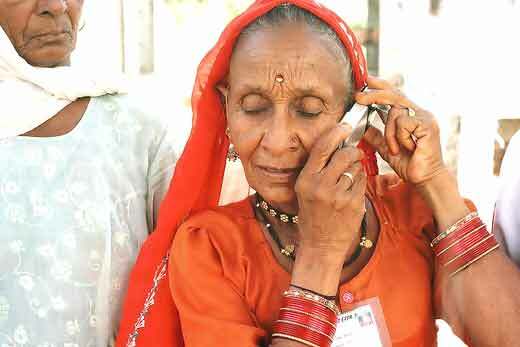 So next time you are thinking of reaching the villages and small town audience in India, Think Mobile ! Will this new ‘Googly’ trump Microsoft once again? BSNL Launches New Unlimited Calling Plans; Vodafone Brings 3GB Data Packs! Mobile phones were indeed the best medium until the TRAI introduced DND and the limit to send SMS. Now India is 2nd largest country in wireless customers by beating USA. now USA is on 3rd rank. Kirpal sinh, VAlid point made…traditional media ads don’t work well in rural areas…A complete different strategy has to be adopted to successfully market the brand in Indian villages.. I am Kirpalsinh Vala from Ahmedabad. Basically from a very small village 100 Kms far from Ahmedabad. -What villagers think when some new ad they see eighter on TV or Hoarding ! Because whatever we believe is our belif but when you sit among them and here their discussion that time we get the trick or idea that what they requires to realy belive in to an Ad. In villages everybody gets togather after dinner and discusses about what they see New in the Village. Or you can catch the “Talk of the Village” i mean same as “Talk of the Town”. We can have more idea, effective ideas to advertise better in Rural India. Thanks for dropping by. You are right, the mobile advertising is in very early stage, but potential upside is huge. We need a few more examples like the one given above to raise the eyebrows of potential advertisers and ad agnecies. I think you have got into right space at probably the best time, but there is huge competition awaiting you in coming days. I will not surprised if there are 4-5 major players coming up with their own mobile ad network, including the big wireless telecom companies. They sure will not want to split the revenues with 3rd party ad network. So just wait for Relaince, Tata, Bharti and AT&T to jump the bandwagon. My suggestion to initiate having tie-ups with these guys from now and you could probably be very good candidates for acquisition from these biggies. mobile advertising in India is at a very nascent stage. but it is only a matter of time before we see an exponential growth in mobile advertising in India. and when the 3 g spectrum is open, there is bound to be a mad rush by the advertisers to occupy by the mobile advertising marketplace. and for rural areas sms marketing with regional language targeted on the basis of area and age will see good results. believing on this future we have started a mobile advertising platform called Zestadz and mobile community called mklix.